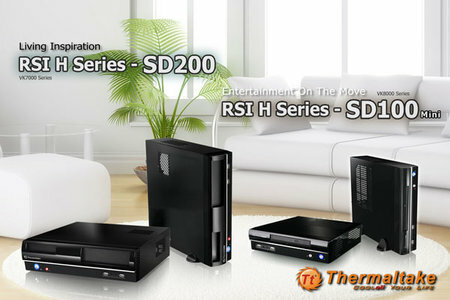 Thermaltake had released SD100 Mini & SD200 digital home media chassis. With the small form factor design, SD100 Mini (Mini-ITX) SD200 (Micro-ATX) are able to fulfill the home theater builders’ demands in the micro HTPC market. The Thermaltake SD100 Mini and SD200 are not only beautifully designed with high quality piano coating exterior, but the internal structure and thermal modules have also re-designed to overturned the common impression of limited spacing and ineffective thermal solutions towards home theater PC chassis. With the stylish and contracted body structure, SD100 Mini & SD200 do not require too much space on your desk or TV cabinets. 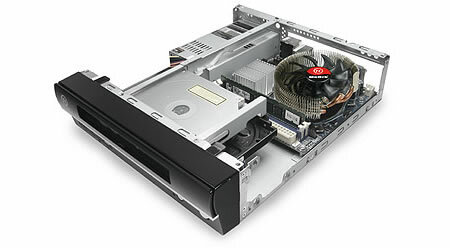 The SD series has build-in mini-size flex ATX PSU and vertical foot stand. With the vertical foot stand, user can position it in more flexible way. With its slim size and superior lightweight, Thermaltake SD100 Mini & SD200 mobile digital home media chassis is your only choice when building mobile digital home entertainment center.